Marek Hamšík produced a delightful assist and scored one for himself as Slovakia overcame a late Russian fightback to take the victory in Group B. Two goals late in the first half including an incredible curled effort helped the Slovaks climb to a huge advantage, although Glushakov made for some late nerves when he converted Shatov's cross. The Slovakians were able to hold on and get their first ever win in the European Championships. Russia got the action under way in front of a visibly reduced attendance, possibly deterred from the violence at the weekend, playing under a closed roof at the Stade Pierre-Mauroy. Smolnikov was in need of some early treatment after taking a blow to the arm, although he was good to return. Meanwhile, Slovaka pressed well to unsettle their opponents. After the feeling-out process formalities had passed on, Artem Dzyuba had the first big chance at goal, as his effort was deflected off target from the edge of the box. A minute or so later at the other end, Marek Hamšík's half-volley fizzed over the bar after a mishap set up the opportunity. Unfortunately for the Russians, Hamšík would only get better as the first half wore on. Physicality of both sides did certainly reduce the quality of the football for many portions of the first half. However, it didn't mean there was a lack of chances. After Smolov skied his shot over the goal, Dzyuba's header was stopped well by Kozaciík. More chances followed for Leonid Slutsky's side; as Smolov struck off target before a dangerous cross by Shatov was cleared by Skrtel. Despite all those opportunities, it was a piece of magic from Marek Hamšík which opened up the game. He lofted a pinpoint delivery from the early territory of the attacking half Vladimír Weiss, who cut inside to beat Smolnikov and Ignashevich, then curled it past the keeper to give Slovakia the lead. Like a deer caught in the headlights, Russia looked dazed and were just looking for the half-time whistle. But yet again, that man Marek Hamšík would come to trouble them. After he skipped past defenders and let fly off target, the Slovaks would take the game completely away from their opponents, just before the interval. A corner was played short to Hamšík on the left, cutting on to his right foot. At a tight angle just inside the box, he curled it into the far corner leaving everyone amazed at his quality. With the half-time break ensuing, Slovakia were in total control. They began the second half with further control. 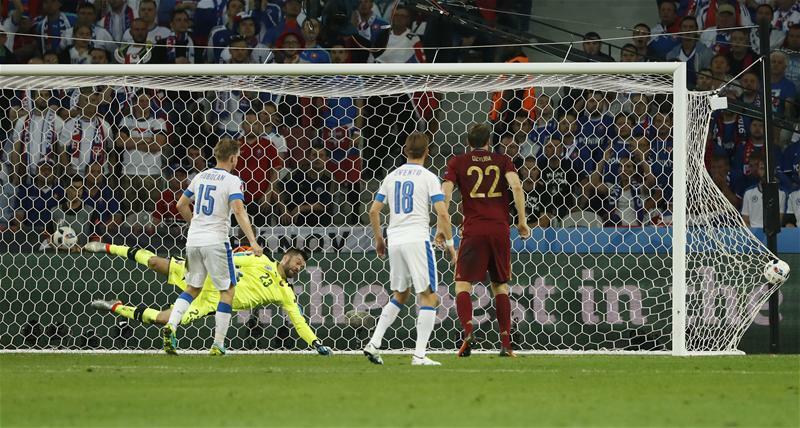 After knocking the ball around at ease, they forced a stop from Akinfeev who denied Mak. They looked strong on their breaks although Russia were keen to prove that they were down but not out - Shatov had a go but fired well off target while Dzyuba was closed down in the area. Smolov had his head in his hands and rightfully so when he missed the chance to turn the game around. The ball fell to him in the area to volley towards goal, but Durica got in the way to block it and take it away from goal. On the subsequent attack, Hamšík had a chance to run at the defenders but couldn't get a clean shot at goal. After strolling their way through most of the second half with Russia showing little to threaten their lead, Denis Glushakov would give Russia hope as they pounced on a block to set up for a nervy final ten minutes. Shatov found his way into the left of the area after some quick passing, after a clearance was blocked and sent into the area. Glushakov was probing in the box and headed a low effort to the right to put the Russians back in it. All of a sudden, it was the Slovakians who looked shaky, only just managing to deal with the attacks that followed. A sea of white shirts sat deep and prepared for more bombardments while the keeper only just managed to knock away a cross. Their keeper was well out of it when another corner followed, but luckily Russia headed away. With stoppage time approaching, the Slovaks got the ball in the attacking corner, bringing down the valuable seconds. Russia had further chances, but they couldn't convert, and victory belonged to Slovakia.